If your home’s flooring needs an upgrade, consider installing new hardwood floors. Hardwood flooring is widely regarded for its natural beauty, durability, and ease of maintenance. With assistance from a company that specializes in hardwood flooring in Newburgh, you can replace your old, worn out floors with brand new wood flooring that is sure to impress your family and friends. To help you navigate the wood flooring installation process, here are some hardwood flooring terms that every homeowner should know. As you are shopping for your new hardwood floors, your contractor may ask you to decide between unfinished and prefinished wood. When wood is in its natural state, it is not sealed against moisture, scratches, and other forms of wear. Prefinished hardwoods come to your home with a protective seal that has already been applied in the factory. 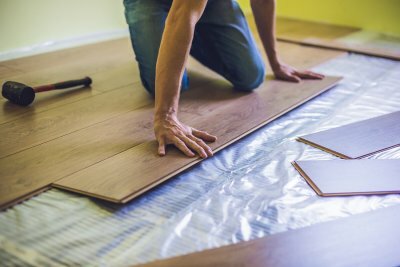 If you go with unfinished wood floors, your flooring contractor will need to apply the finish after the installation project is complete. Engineered floors are becoming increasingly popular for modern homes. Unlike natural hardwood floors, which are crafted from single pieces of wood, engineered floors are composed of several different wooden layers. When you choose engineered floors for the interior of your home, you will have the peace of mind that comes from knowing that your flooring is extra resistant to wear and tear. Engineered floors are also typically indistinguishable from natural wood products, so they will still provide your home with exceptional beauty. Before you embark on your wood flooring installation, you will need to get a sense of which species of wood will look best in your space. Hardwood floors can be crafted from many species of wood, including oak, maple, and hickory. Each flooring species has a unique look, as well as characteristic, durability, and hardness. At the flooring showroom, you will be able to tour some different species of hardwoods in person.